Why does it feel like a typical doctor’s appointment is just a quick blood pressure check and you’re out the door in 15 minutes? That’s way before you get the chance to explain your suspected gut-health issue or ask why you’re struggling to turn your brain off at bedtime. 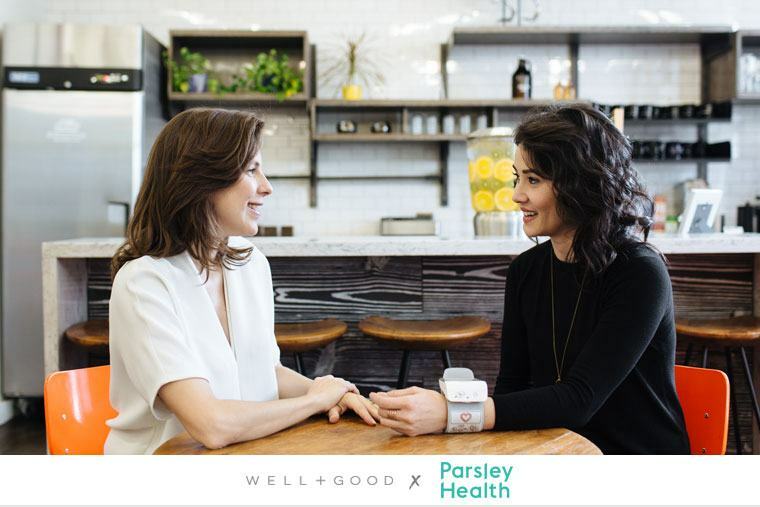 Pioneering physician and Well+Good Council member Robin Berzin, MD knows how frustrating that can be, which is why she and Parsley Health are changing what it means to have a relationship with your doctor (who won’t shrug off your concerns as NBD). At Parsley Health locations in Los Angeles, New York City, and San Francisco, Dr. Berzin has given people a taste of what a whole-spectrum healthcare plan looks like—from dealing with mental health to eating habits, and everything in between. But if you were hesitant to tack on to your existing health expenses (you have to continue funding your matcha latte habit somehow, after all) Parsley Health is now offering three more accessible membership plans—and Well+Good readers can get $100 off (serious deal alert!). As a bonus, you also get major perks like exclusive discounts on meal delivery from Sakara Life, non-toxic beauty products from Cap Beauty, and a year of free meditation on the Headspace app. Because Parsley Health gets that wellness doesn’t mean just popping an antibiotic when you have a cold—it’s about listening to what your body is telling you. Keep reading for three reasons a Parsley Health plan might be for you. “I can’t tell you how many people I see blowing money on workouts, juices, cleanses, and products, when really underneath they have a thyroid problem, or an inflammation problem, or a gut issue that not all the spin classes in the world could fix,” Dr. Berzin explains. With these people in mind, she designed the new Parsley Assessment, which Dr. Berzin says is perfect for “health curious” people who feel pretty good but want to make sure their health is on a firm foundation by getting bloodwork, an in-depth history and physical, and a plan crafted for them by a doctor. She recommends that everyone get the Parsley Assessment once a year, and then judge whether they need a more involved game-plan. So go ahead and drink that green juice (they’re delicious, after all) but if you’re hoping it clears up your skin and helps make you more regular, you might consider letting the Parsley Assessment take a closer look for underlying problems. You know something feels off with your health and you’re pretty sure it has something to do with your digestion (thanks to, ahem, frequent trips to the bathroom). But you eat a super healthy diet—no processed foods in sight!—so what gives? Rather than slap on a general diagnosis and call it a day, Parsley Health takes the extra step to help actually figure out what’s bothering you. First, you get prescreened using a blood test for common problems like cholesterol, thyroid, and nutrient imbalances. Then, if you still haven’t identified the problem, you get access to Parsley Health’s advanced biomarker testing. Parsley Health looks at areas like food sensitivities, heavy metals and toxins, cortisol (or stress hormone) levels, and signs of autoimmune issues. Instead, Parsley Health looks closely at areas like food sensitivities, heavy metals and toxins, cortisol (or stress hormone) levels, and signs of autoimmune issues. Plus, the test can even examine imbalances in your microbiome, or the community of bacteria that lives in your gut. Dealing with a chronic condition like diabetes or PCOS on your own can be tough (see: the dangers of falling down a WebMD rabbit hole), which is why Dr. Berzin wanted to create a care plan that felt more like a partnership for people dealing with ongoing conditions. “The annual Complete Care membership gives you the time you need to work with your doctor, get testing on an ongoing basis, and constantly update your health plan based on what’s going on with you,” says Dr. Berzin. And she’s serious about the partnership part—with the Complete Care plan you can even message your doctor if you have a concern or question that doesn’t warrant a full appointment. Still on the fence? Annual members have found major help for heart disease, vasculitis, infertility, and GI disease after working with Parsley Health over time, according to Dr. Berzin. Sign up for one of Parsley Health’s three new memberships (and get $100 off by October 31!) via this exclusive deal for Well+Good readers.